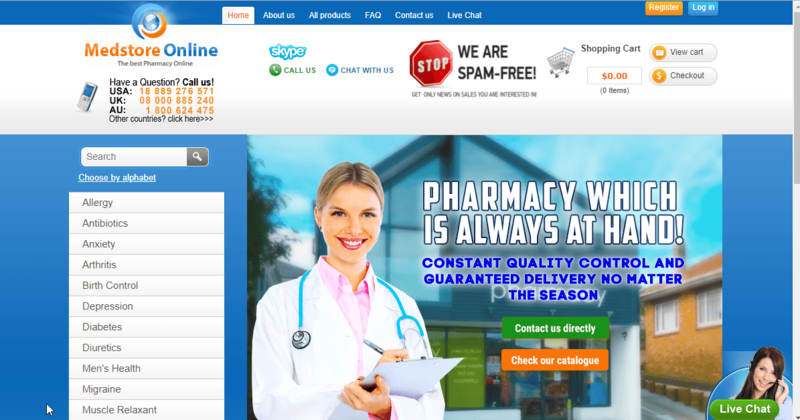 Medstore Online: Can You Order and Get Genuine Medications? Medstore Online is a store that has been online for quite some time now. They have been operating since the year 2009 when they were established. This store claims that it acts as a broker on behalf of several pharmacies that sell affordable drugs. They claim that they have the ability to save their customer’s time and money by taking care of the delivery of the high-quality products that they sell. They say that they offer fast shipping and they always guarantee of delivery when the customer places his or her order. They offer a variety of drugs. The drugs they offer are for different conditions. These include allergy, antibiotics, anxiety, arthritis, birth control, depression, diabetes, men’s health, migraine, muscle relaxant and more. They have three different phone numbers on their website. One for the USA, another for the UK, and another one for AU. They also offer Skype as a method to talk to their customer care. Medstore Online website tries hard to prove that they are genuine. But, is this the reality? The above reviewer says that Medstore Online shipped his order to the wrong location and the post office delivered the drugs to the wrong location. To cut the long story short, the above reviewer reports that he never got his order. He also says that Medstore Online blocked all his contacts including his email and phone such that he could not communicate with them again. Since he had used an electronic check to pay for his medications, his bank could not do anything to help him get his money back. He says that he lost $228.96. He tells people to be careful. He warns them against dealing with Medstore Online. The above reviewer says that no order came. Medstore Online told him that they would give him a refund. That was about 2 months when he was writing the review. He has not received the refund. After asking them again they told him that they do not work with the payment provider anymore. They directed him to go to his bank and ask for a refund and also report it as a fraud to the bank. The above reviews were the only ones that we were able to locate. All of them are negative. Both customers did not get their order. This shows that the company may be illegal or rogue. We decided to further determine whether the company is really rogue. The first thing that we noticed after searching for Medstore Online on Scam Adviser is that the website had a very low trust rating. 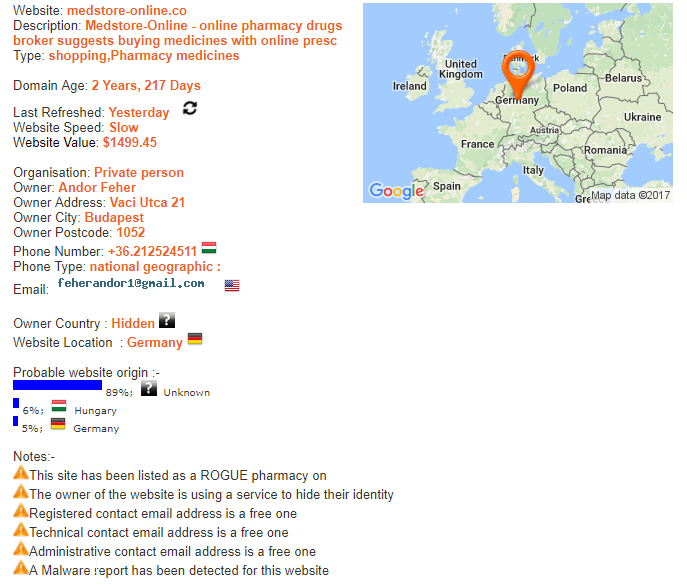 ScamAdviser listed Medstore Online as a rogue pharmacy. The service also indicated that the website owner was using a service to hide his identity. They also detected a malware report on the website. This tells you that the pharmacy is not safe. 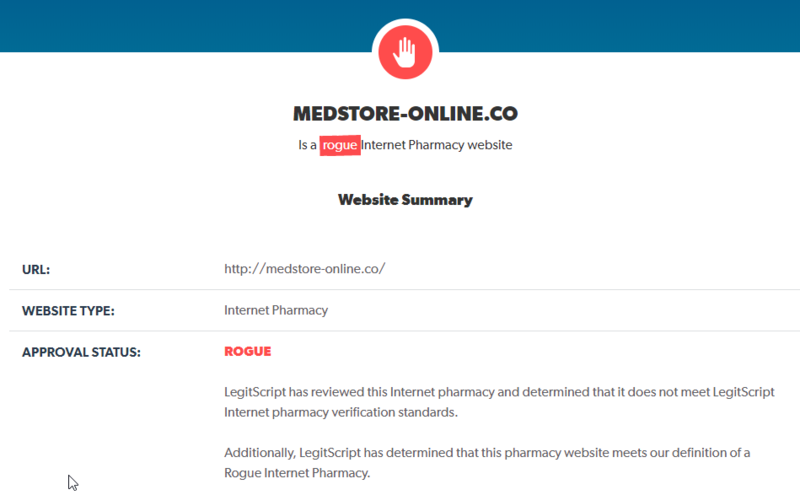 LegitScript clearly indicated that Medstore Online is a rogue store. The site didn’t qualify to be a real store according to their standards. However, according to the characteristics that they were able to detect, the website seemed to be a rogue one. The above reports coupled with the reviews available online show that Medstore Online cannot be considered as a genuine online pharmacy. In short, this is to tell you that this pharmacy is illegitimate. This means that it has to be approached with caution. The store claimed to offer the buyer a chance to save $15 on their orders when they paid using an Electronic Check (ECheck). They also allowed the buyer to save 20% when they paid using bitcoin. One thing you need to know is that it is not recommendable to pay for your meds online using other forms of payment. Credit cards are the best payment method. From the evidence that we have already seen, Medstore Online falls under the rogue pharmacies category. 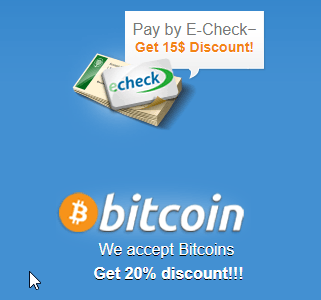 As you can see in the above offer, the pharmacy is trying to get people to pay using Echeck and bitcoin. This is because Medstore Online knows that there is no chance to dispute your charges when you pay using the two methods. This further proves that Medstore Online is trying to rip customers off their money. From all the evidence that we have seen online, Medstore Online is not a drug vendor that can be trusted. This store has very bad customer reviews. The sites that we have checked have already listed Medstore Online in the rogue pharmacies section. They are also trying to force the buyer to pay using the methods that they know they cannot get a refund. This means that you are likely to be ripped off your cash if you order from them. The best way to get your meds without having to undergo any troubles is by ordering from real pharmacies that have been investigated by experts. We recommend these types of pharmacies in our catalog.